Trained as a woodworker, and a practising sculptor from the age of 20, Dan Ohlmann became an interior decorator and designer in his thirties. In the 1980s, he began creating sets for theatre and opera productions. The many ‘pre-project models’ he prepared for the directors awakened a passion in him for creating miniaturised scenes. In 1984, he created his first collection of miniature furniture. Driven by his passion for the Art Nouveau style, he created a 1:12 scale model of the interior of the famous restaurant Maxim’s de Paris in 1985. This ultra-realistic piece, a combination of artistic performance and architectural skill, wowed in France. Having moved to Paris just two years earlier, the miniaturist became the focus of intense media and public attention in 1986. Articles appeared in all the biggest magazines, and he was a guest on the biggest prime-time television shows in France. At the same time, Dan Ohlmann was working as the artistic organiser and co-founder of the first International Miniatures Festival, which welcomed 25,000 visitors over 5 days. He launched his own travelling exhibition entitled “The Miniatures of Dan Ohlmann”, presented in a series of cities in France and elsewhere in Europe, and even several times in Japan. His work was also exhibited in the United States as part of a 1986 tour under the patronage of the French Ministry of Culture. In 1989, his three lorries full of miniatures arrived in Lyon for a 2-week exhibition. 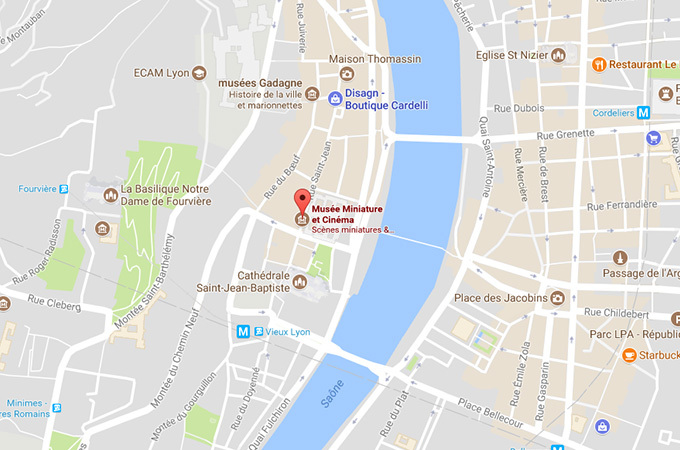 He instantly fell in love with the city and decided to found his first museum in Vieux Lyon: the Palais de la Miniature. He spent his days in the studio, creating new miniature scenes to expand his collection. In 2003, a Swiss collector who was well known in the world of miniatures offered to help him transform his small family-run museum into a world-class attraction. His new patron’s support and passion for the arts allowed him to move the museum to the ‘Maison des Avocats’, a large building in Lyon dating back to the 16th century and listed as a UNESCO World Heritage Site, which she then purchased. In 2005, his new museum opened its doors: the Musée Miniature et Cinéma. He still creates ultra-realistic miniatures, fascinating creations that he calls “Réels” (the Real Things). Joined by his faithful collaborators, he now dedicates a large portion of his time to his other passion: introducing the public to the exceptional talent of film studio artists. For him and his team, restoring rare pieces from film sets helps to preserve an important part of cinema history: the special effects techniques used before the era of purely digital filmmaking! He particularly appreciates the two immersive arts of miniatures and film special effects because they play with reality, subterfuge and trompe l’oeils.